5 Worlds. 3 Unlikely Heroes. 1 Epic Battle for the Galaxy! Oona Lee surprised everyone--including herself--when she lit the first beacon to save the Five Worlds from extinction. Can she light the other four beacons in time? Next stop, Toki! On the blue planet, Oona must face the sister who left her, and bring to light the Cobalt Prince's dark secrets. Meanwhile, An Tzu is fading away as his mysterious illness gets worse. Will it stop him from joining the fight? Or will his unique magic be just what the team needs?And Jax Amboy is a hero on the starball field, but in a moment of real danger, will he risk everything to save his friends? 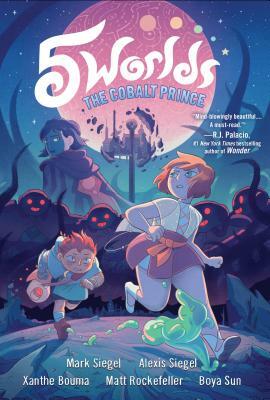 Oona must rely on some surprising new allies in order to stop a terrible plot from unfolding and continue her quest across the 5 WORLDS! MARK SIEGEL has written and illustrated several award-winning picture books and graphic novels, including the New York Times bestseller Sailor Twain and Oskar and the Eight Blessings. He is also the founder and editorial director of First Second Books. He lives with his family in New York. Follow Mark on Tumblr at @marksiegel and the 5 Worlds team on Twitter at @5WorldsTeam. ALEXIS SIEGEL is a writer and translator based in Switzerland. He has translated a number of bestselling graphic novels, including Joann Sfar's The Rabbi's Cat and Pénélope Bagieu's Exquisite Corpse into English and Gene Luen Yang's American Born Chinese into French. XANTHE BOUMA is an illustrator based in Southern California. When not working on picture books, such as Little Sid, fashion illustration, and comics, Xanthe enjoys soaking up the sun, beachside. Follow Xanthe on Tumblr at @yumbles and on Twitter at @xoxobouma. MATT ROCKEFELLER is an illustrator and comic artist from Tucson, Arizona. His work has appeared in a variety of formats, including book covers, animation, and picture books such as Train, Rocket, and Pop! He also illustrates the middle-grade series the Explorers. Follow him on Tumblr at @mrockefeller and on Twitter at @mcrockefeller. BOYA SUN is an illustrator and coauthor of the graphic novel Chasma Knights. Originally from China, Boya has traveled from Canada to the United States and now lives in Northern California. Follow Boya on Tumblr at @boyasun and on Twitter at @boyaboyasun.